Tap Tap Dash is full of twists and turns and probably the hardest game to beat. Developed by Mostro Games, this auto-runner tests your nerves while you guide your cute character along an unpredictable path full of sharp turns. While moving, jumping or changing direction, make sure your character stays in the middle of a path. If it moves along a path’s border, then chances of falling off it are more. In most levels, the appearance of a path can be unpredictable. A much dangerous, narrower path may soon follow a broad, easy to move path, so if your character veers off the path slightly and keeps moving along a path’s border, it will fall off it as soon as the narrow path begins. Keep your creature in the middle of path as long as possible, tap when it touches the green circle and focus on sharp turns. 2. When Should You Use Snails? There are 250 levels in Tap Tap Dash. But not all levels are hard to play. Some are fairly easy, with few steep turns, and a shorter route to the next level. But then, there are those insanely frustrating levels that are seemingly impossible to complete. This is where snails will come into play. These cute little gastropods will move slowly, making it easier for you to move along sharp turns and jump from one path to the other. Once you reach a level, the snail will go away and will be replaced by your selected creature. To get a free snail, tap on the “Play with Snail” button and then tap on the video icon. Sometimes there won’t be any video offers available, so you may have to wait until the button flashes. A flashing “Play with Snail” button indicates a video offer is available. In some occasions, you will receive two snails for watching a video advert. Look for the “Double Reward” banner flashing on the top-right corner of the screen. Tap on it, watch a video and get two cute gastropods. Save them for harder levels. The reward banner appears after the game ends. The most frustrating part of this game is the moment where you have to jump from one path to the other. It’s not easy to go to the next level, especially when the entire path is broken into shorter paths and all you have to do is hop, move, turn hop and hop again until you reach safely. Here, timing is important. Also, your focus should only be on the green circles. When it’s time to jump, don’t tap too early. Wait and tap when the creature touches the green circle fully or at least a major part of it. If you tap when the creature touches only a small part of it, then it will fail to reach the next path. Don’t be too late with your taps when you reach the edge of a path. When hopping between shorter paths, your first jump decides how well your future jumps will be. 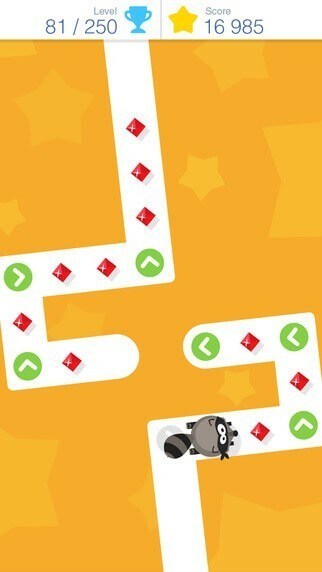 Once you get that perfect jump, tap fast to jump from one path to another keeping in mind that the creature should touch the green circle in every path. Time your jumps and tap quickly when your creature touches the green circle. Yes you can catch a glimpse of a failed level. The bird’s eye view of a level lets you identify the spot that got your character killed. You can also get a “zoomed out” view of half of the path if your character dies mid-way. Just tap anywhere when the “Failed” screen appears to view a level. That’s right. In several levels, you will notice your character moving slowly. Also, not all levels are hard. You will find plenty of such “breather” levels that are slow-paced; some allow very few jumps and have only one or two sharp turns. You can easily complete them without using snails. Tired of those popup ads? They can really hamper gameplay and kill your character midway. You can disable Internet access and still play this game. The only drawback is that you won’t get those free snails. You will need to be online to receive video offers and completing them will give one of two snails. You may try this: Go online, watch videos and collect 2-3 snails. Turn off the Internet and use those snails that you have collected before, for tough levels.